Looks as if Jeremy Renner is the new action man around town nowadays. First, he set himself up with MI: GHOST PROTOCOL, and now he is taking over the Bourne franchise. 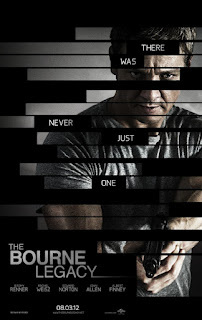 The first trailer for the new entry, THE BOURNE LEGACY, hit today. "There was never just one"?? What a fabulous idea to keep this series alive. It builds upon the established history, but it is able to show us more of the world and the Treadstone program. And Albert Finney and Joan Allen are back? This could get fun. THE BOURNE LEGACY will be released August 8, 29012 starring Jeremy Renner, Albert Finney, Joan Allen, Edward Norton, and Rachel Weisz.